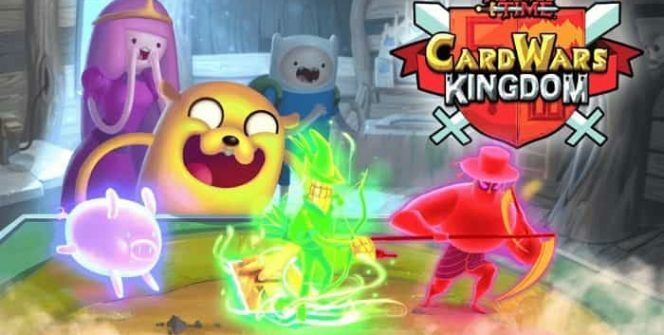 Card Wars Kingdom is an online adventure game from Cartoon Network. It is based on the Adventure Time animated series and features popular characters such as Finn, Princes Bubblegum and Jake. 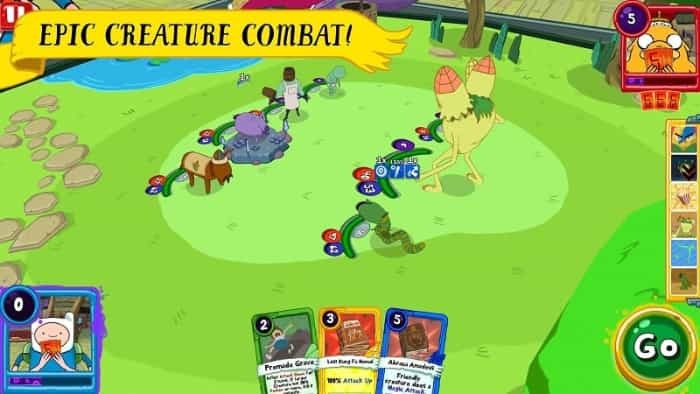 The trading card game is designed for android and iOS devices, but it can be downloaded, installed and played on a PC with the help of an android emulator. It is equipped with excellent features to allow you enjoy every moment. The game allows you to assemble a team of powerful creatures that will help you fight for the Card Wars glory. It also allows you to unleash the power of floops, landscapes and spells in order to intensify your fights. In addition, the game presents you with an all-new combat system that will help you kill your enemies more efficiently. In Card Wars Kingdom, you can collect hundreds of creatures such as Cool Dog, Husker Knight and Pig. You can also fuse the creatures to make them more powerful. With powerful creatures, you can easily level up and unlock new cards and abilities. In order to keep the creatures more active, you can feed them with cakes. It is wise to feed them with cakes that match their elements. Some cakes include Corn and Swampland for Corn and Swampland creatures respectively. The creatures possess different cards, and you should work around the type of cards your creatures possess in order to be more successful. Some creatures have cards that possess healing power while others have cards with magic power. There are many heroes you can choose in the Cartoon Network adventure game, but the most popular ones include Finn, BMO, Jake, Princess Bubblegum, LSP and Marceline. Each hero has special cards that can change the game completely, so ensure you find these cards and use them widely. You will be discovering new heroes as you continue to play, so be keen to grab any hero that becomes available to you. You can also acquire heroes with the game’s currency. One way to get free rewards in Card Wars Kingdom is to play the game every day. You don’t have to play for hours: just signing in and playing for a couple of minutes every day is enough to earn you rewards. There is a Skeleton Chest that comes with daily freebies, so ensure you take it when you sign in. You should also go into the Treasure Cave and get a new creature from the Daily Chest section. Get in the Strike dungeons and test your skills as you fight with other characters. There are many daily challenges that can help you improve your skills in these special events. You can also earn cards and loot other valuables when you take down enemies. Concerning the multiplayer actions, you can get involved in PVP battles, share your creatures for rewards and borrow creature assistance from your allies. You don’t have to struggle with a small screen or poor control when you can download and install the game on your laptop or desktop. As mentioned above, you only need an android emulator. Sometimes when playing Card Wars Kingdom, bluestacks ask you fee to pay but gives you option to download some apps. Every time it asks you just select “Install apps” and continue using it free. I hope you enjoyed this guide, please rate and share. 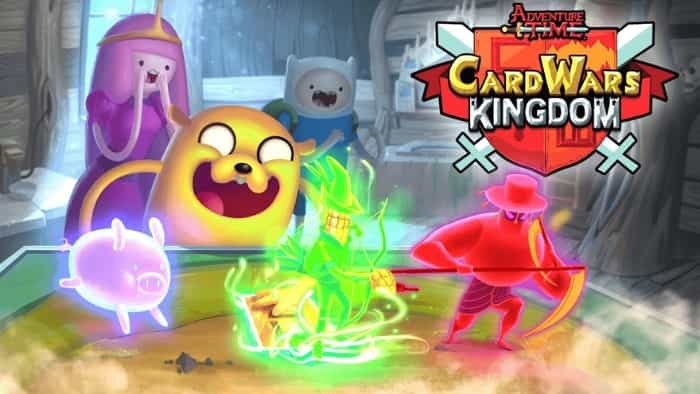 If you have problems running Card Wars Kingdom on desktop or any other issues, leave a comment below.